I’ve been testing and providing feedback on the Hummingbird Hammock Single for many months now, and have seen a few iterations so far. 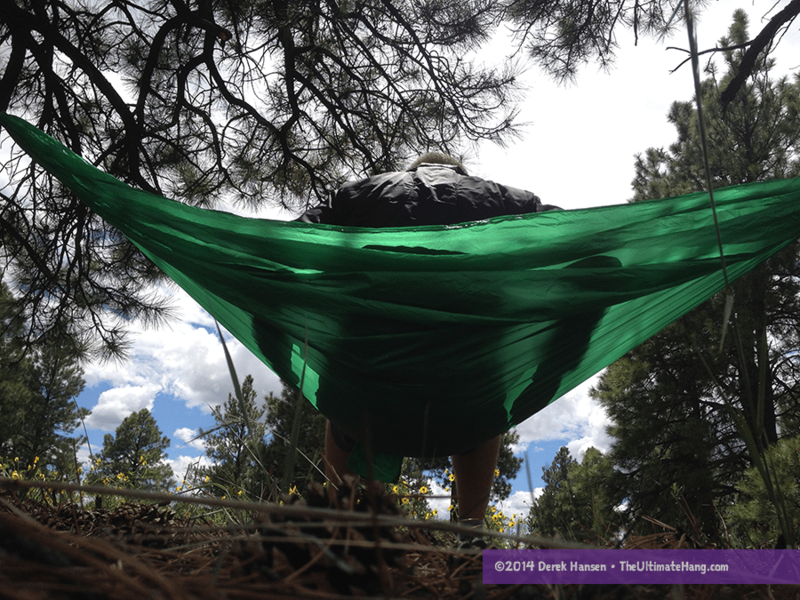 The main selling points for their Single hammock is the lighter weight and smaller pack size. Hummingbird Hammock is achieving this with trimmed dimensions, lightweight fabric, and unique suspension connections. One thing that has really driven innovation in hammock camping has been the intersection of industries: Whoopie Slings from arborists, Marlinspikes from seamanship, and fabrics from outdoor industries to name a few. Chris Loidolt, the Hummingbird designer and FAA certified parachute rigger, brings his expertise from skydiving. Chris also uses soft shackle carabiners made from spectra cordage. It’s a technique used by many ultralight backpackers and hangers looking for a lightweight but secure linkage. Chris’s soft shackles use a unique connection that I’ve not seen before. Instead of using an eye splice and adjustable bury, these shackles use two eye splices (sewn and non-adjustable). One eye splice has a small piece of webbing sewn that acts as a toggle. One eye loop is fed through the other with the webbing tab and is then folded over into a Lark’s Head knot. Soft shackles can be a bit tricky, and their real appeal is all about weight savings. I’ve found that an even simpler solution for infinite adjustability is to skip the soft shackle and just use the end loop on the hammock. A long webbing strap, or a short strap and a long length of Spectra line or Dyneema can then be tied to the loop using a modified Double Becket Hitch. But how you connect this hammock to the suspension and anchor point is one of the great debates, and somewhat academic (and completely personal). One compromise with lightweight fabric is stretch, which can make it difficult to lay diagonally. When I sleep in hammocks that use 1.0 or 1.1 oz fabric, I usually slip into a central “rut” over time. This doesn’t mean the hammock itself is uncomfortable, and I would take this hammock when lighter weight and lower bulk are the main objectives. I usually sleep in a fetal position or with “frog legs” in smaller hammocks such as this. In addition, the smaller dimensions means I hang the hammock with a tighter suspension, about 15 to 20 degrees. The construction and materials are very good. The stitching is tighter than most, but still serviceable. The edges are hemmed, and a few loose strands of nylon had escaped on my model (a product of raw cutting vs. using a hot knife). The stuff sack is about as small as you can go to get the fabric stowed, and everything is nice and tight. 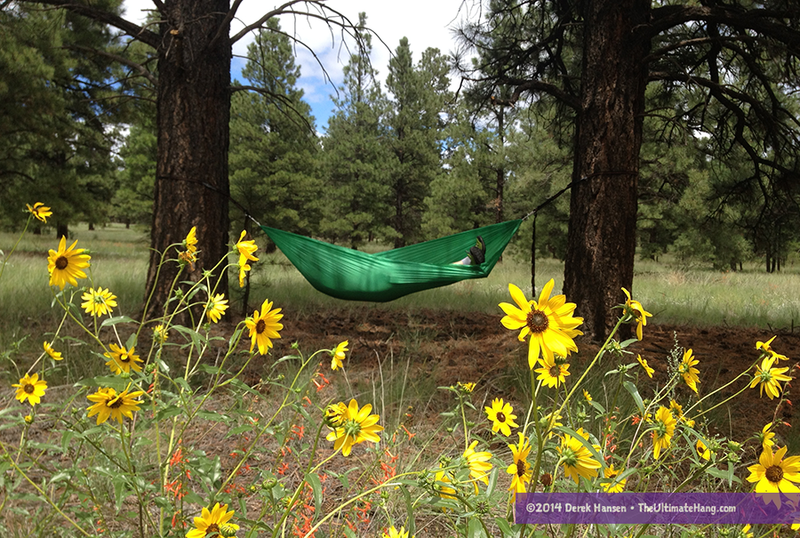 The Hummingbird Hammock Single is one of just a few ultralight hammocks on the market. It provides some great competition in a niche market for folks looking to really drop weight and bulk in their packs. This hammock is also a nice addition for folks who want to lounge out on a day hike without adding too much to their summit packs. Because of its lightweight fabric, I wouldn’t recommend this hammock for everyday roughhouse use. This isn’t a hammock I let my kids play in. So … how does it compare to the champion of UL hammocks, the Grand Trunk Nano? The Nano is 5oz. and 5 ft. x 4 ft. (according to your earlier review) so it’s a little smaller and heavier. Does it sleep better? The Hummingbird Single is slightly lighter or just about equal when comparing just fabric to fabric. My measurements on the Nano that came out to 5 oz (dimensions are 9 × 4 ft (2.7 × 1.2 m) are for the fabric only. 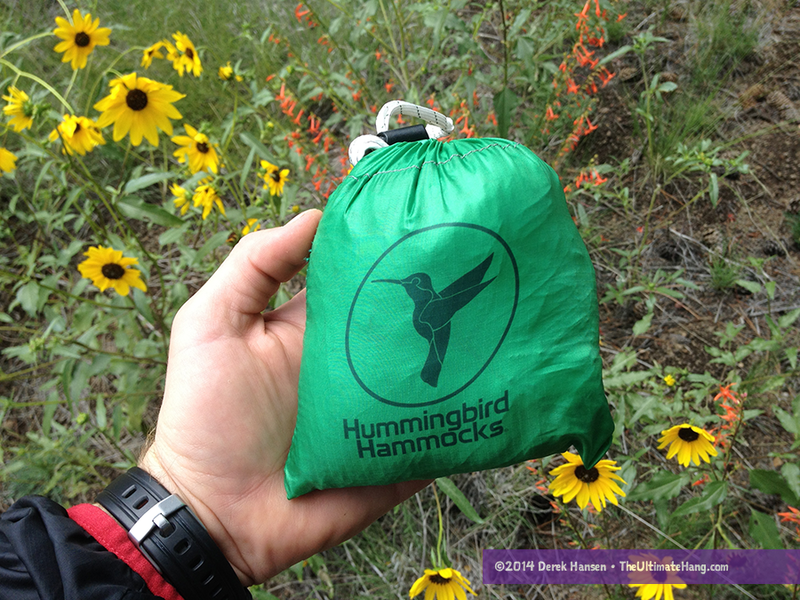 The Hummingbird at 5 oz includes the rope loops on the ends and the soft shackle carabiners. The Hummingbird is just barely smaller, and I’m sure to some, I’m splitting hairs. The fabrics are very similar, but I think the Nano stretches just a little more than the Hummingbird, but I would say the lay is about the same. In terms of ‘best lay’ in the UL category, my vote is will the BIAS Weight Weenie Micro. It’s 1 ounce heavier (depending on how you accessorize it), but the longer length more than makes up for it. I sleep much better, without compromises, in the BIAS. Sounds like my DD Hammocks Superlight hammock. Have u had a chance to demo it? I’d almost forgotten about the new offering from DD. No, I haven’t tested that one. What is your experience with it? I loved my old grey BIAS WW. I’d like to find a replacement. I skipped the WW (now only in green). I haven’t really learned to love it. I’m still looking for a long and light alternative to slot into the “go-to” hammock set up place that the WW micro doesn’t really fill. Any other tips for a long and light simple hammock? http://www.webmd.com/sleep-disorders/news/20110621/hammocks-help-you-sleep had never considered this 🙂 now I just need to figure out how to rig one in the bedroom when the queen mattress takes 30% of the room. Great site Derek! Can you discuss the stretch aspect a bit more? I recently slept in an Eno double and slept like a baby. I was able to stay on the diagonal and even sleep on my side with my legs in fetal position. How will the Hummingbird fabric compare to the Eno? I am looking at the Hummingbird double as a way to drop my pack weight. But, it wouldn’t be worth bad sleep. It’s more a question of how heavy you are and how much the fabric will stretch for you. I sleep cozy in the hummingbird. I am 6’4″ 200lbs. Really trying to get an idea how much I am going to dislike the plasticy feel and lay vs the soft tafetta nylon of the eno. What about warmth? Is the hummingbird warmer? Thank you Derek! The hummingbird is light and thin. If anything it will feel cooler than the thicker ENO material. The hummingbird is a true parachute nylon material. It is all about weight savings. The dramatic difference in size and weight are the two main features. There may be some compromises for some folks but if you are looking for the lightest, most comfortable hammock, is it worth it? Awesome! Thanks for the feedback Derek.